Scalar energy is also known as prana, chi, radiant energy, zero point energy, qi, orgone. After years of experimentation and modification, he developed a technique using scalar energy that will transmute pathogens quickly and painlessly. This technique facilitates the use of photographs of people who desire to have pathogens transmuted in their bodies. He developed a treatment process whereby he is able to administer the scalar energy reverse-phase angle harmonic of a pathogen, thereby causing that agent of infection to disassemble or fall apart. Scalar energy operates at the quantum level and is capable of disassembling all types of pathogens thus eliminating the causative agent of disease. Once the causative agent of a pathogen disease has been eliminated the symptoms associated with that infection decrease or disappear altogether. Recent discoveries as of March, 2012, led him to the conclusion that viruses can likewise be transmuted by this process of broadcasting scalar energy. Emboldened by these discoveries, Tom wishes to present the world with the cure for ALL bacterial, fungal, protozoan and viral infections. It is his belief and statement that the scalar energy is capable of transmuting ALL pathogens thus presenting the world with the CURE for thousands of pathogenic diseases. May the world one day soon recognize this great gift from God. 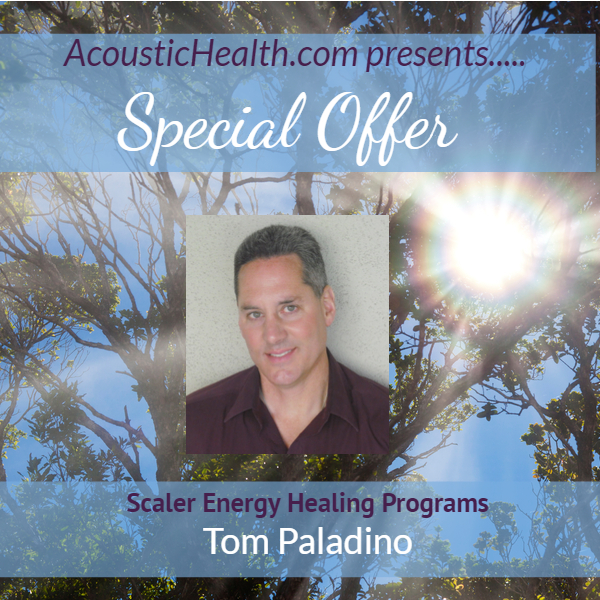 Tom Paladino’s amazing program gives you 30 days of the Pathogenic cleanse, Nutrient therapy and Chakra Balance sessions. To disassemble a pathogen means to take it apart. It is reduced to its original element, i.e., carbon, nitrogen, oxygen, etc. The process is simple and painless. Once this occurs, the disease or imbalance disappears. March 2012 – Recent discoveries led Tom Paladino to the conclusion that viruses can likewise be transmuted by this process of broadcasting scalar energy. Emboldened by these discoveries, he desires to present the world with the cure for ALL bacterial, fungal, protozoan and viral infections. It is his belief and statement that the scalar energy is capable of transmuting ALL pathogens thus presenting the world with the CURE for thousands of pathogenic diseases. May 6, 2013 – Tom Paladino had a breakthrough with the herpes virus. December 2013 – Pathogens added: worms, parasites to pathogen cleanse. People and pets are now expelling worms, lice, parasites. May the world one day soon recognize this great gift from God. Tom has not published papers to a scientific authority, foundation, academic group regarding his research. He has focused on working with people for the past 25 years in the area of disassembling pathogens. Earlier subtle energy scientists such as Nikola Tesla, Antoine Priore, Thomas Moray, T. Galen Hieronymus had published papers and received patents for their innovations. Tom began where they left off and worked in the arena of better health. Eventually, to help the body recover from damage by pathogens, Tom began delivering nutrients to the cells via remote scalar. And ultimately, he brought in the chakra balance as the chakra of the body are natural receptacles of scalar light and when functioning properly, distribute scalar to our entire human system.